Venus is noted for its absence of spreading ridges, transform faults, and subduction zones, which are characteristic of plate tectonics on Earth. But given that it exhibits rift zones, mountain belts and other "secondary" features of tectonic activity, should it be considered tectonically active? There has been some considerable modelling about this particular scientific issue, as it is considered important to understand Venusian tectonics to be able to get a better understanding of Earth tectonics (1). So, in answer to your question, is Venus tectonically active, the answer from current research suggests that it is not - but not at the moment, especially not like Earth. Much of the research refers to Venus as currently possessing a "stagnant-lid" single plate (1),(2), (5). The tectonic-like features found on Venus have not been observed to 'fit' a global pattern that would suggest a 'mobile-lid' tectonic regime like that of Earth (1). Much of the recent research has not really focused much on the differences between Earth and Venus - including, the Moon, liquid water and differences in rotation, but rather focuses on what observations of orbiting spacecraft, such as Magellan and the Venus Explorer have revealed and what models based on these have deduced. Recent research has painted a picture that the answer to this question is considerably more complex than would justify a 'yes' or 'no' answer. Modelling from gravity and topographic anomalies observed by several of the space craft that we have sent to Venus suggest that many of these features are derived from 'hotspot' upwelling mantle plumes where partial melting could occur (2). This is supported by an example of a recent re-evaluation of earlier observations of tectonic-like features on Venus was performed by McGovern et al. (2014) (3) of Magellan images, using stereo radargrammatic images, of the graben-like structures that extend from the Venusian shield volcanoes reveal that they, alongside the radial dike emplacements, are accounted for by magma reservoir expansion (1). Models reported by Huang et al. 2014 (2) also suggest that Venus has a very thick lithosphere compared to that of Earth, which would support the high topography noted for Venus (5). Related to this is that in deformation experiments, Azuma et al. 2014 (4) suggest that is a mechanical decoupling of the Venusian crust and the mantle convection (as shown in the diagram below (4)). Huang et al. (2) models also have found that Venus cannot have a weak asthenosphere in the way that Earth does. A relatively short phase of intense tectonism, as indicated by the tesserae, high plateaus, plains deformation and coronae - Turcotte (5) theorises that the formation of coronae could be an indication of a new episode of tectonism. A relatively short phase of intense volcanism, with minor subsidence and deformation. 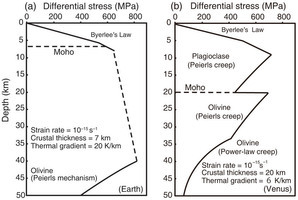 A long period of network rifting (graben formation, modelled to be hotspot induced (3)) and volcanism. Recent modelling by Gillman and Tackley (2014) (6) provide a possible mechanism to the 3 stage process by Head, 2014 (1). Gillman and Tackley's models suggest that the thick Venusian atmospheric surface temperature provides a boundary layer for mantle convection models, in particular, the atmospheric water vapor pressure which is sensitive to volcanic activity. They suggest that cooler surface temperatures result in a 'mobile-lid' type of tectonic regime, that is until the temperature rises again causing a return to the stagnant-lid one plate scenario that we observe today. Not the answer you're looking for? Browse other questions tagged plate-tectonics planetary-science tectonics or ask your own question. How would plate tectonics differ if Earth had no water? What properties must a rocky body possess in order to exhibit plate tectonics? Why do Earth and Venus have different atmospheres? How high can a mountain possibly get?